The PSRAI January 2014 Omnibus Week 1 obtained telephone interviews with a nationally representative sample of 1,005 adults living in the continental United States. 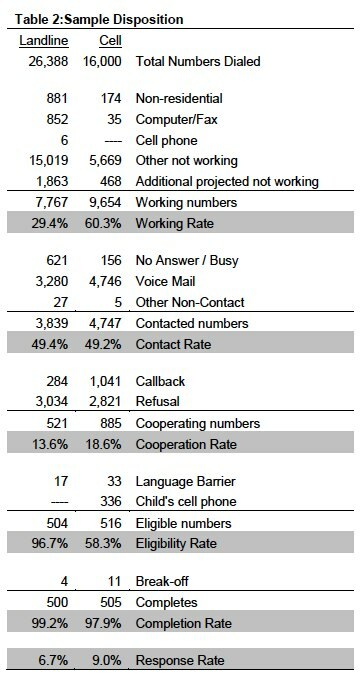 Telephone interviews were conducted by landline (500) and cell phone (505, including 268 without a landline phone). The survey was conducted by Princeton Survey Research Associates International (PSRAI). Interviews were done in English and Spanish by Princeton Data Source from January 2 to 5, 2014. Statistical results are weighted to correct known demographic discrepancies. The margin of sampling error for the complete set of weighted data is ± 3.5 percentage points. Interviews were conducted from January 2 to 5, 2014. As many as three attempts were made to contact every sampled telephone number. Sample was released for interviewing in replicates, which are representative subsamples of the larger sample. Using replicates to control the release of sample ensures that complete call procedures are followed for the entire sample. Calls were staggered over times of day and days of the week to maximize the chance of making contact with potential respondents. Each phone number received at least one daytime call when necessary. Post-data collection statistical adjustments require analysis procedures that reflect departures from simple random sampling. PSRAI calculates the effects of these design features so that an appropriate adjustment can be incorporated into tests of statistical significance when using these data. The so-called “design effect” or deff represents the loss in statistical efficiency that results from unequal weights. The total sample design effect for this survey is 1.31. The survey’s margin of error is the largest 95% confidence interval for any estimated proportion based on the total sample— the one around 50%. For example, the margin of error for the entire sample is ±3.5 percentage points. This means that in 95 out every 100 samples drawn using the same methodology, estimated proportions based on the entire sample will be no more than 3.5 percentage points away from their true values in the population. It is important to remember that sampling fluctuations are only one possible source of error in a survey estimate. Other sources, such as respondent selection bias, questionnaire wording and reporting inaccuracy, may contribute additional error of greater or lesser magnitude. Thus the response rate for the land line samples was 7 percent. The response rate for the cellular samples was 9 percent.